I-Pari: Blogadda and Quikr Free Shopping Feista ! Blogadda and Quikr Free Shopping Feista ! Blogadda and Quikr gave me the exciting opportunity to shop at Quikr.I can shop for Rs 5000/- which will be reimbursed later ,so isn’t it fun ? 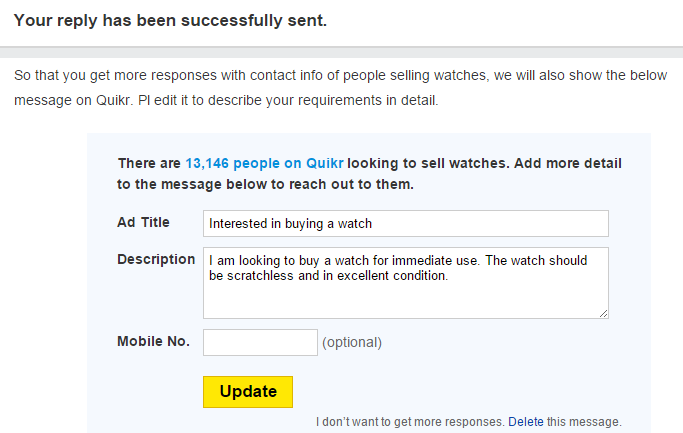 Wasting no time, I pounced on the Quikr website. I already had in my mind what I need to shop ,indeed there were many categories and options such as mobiles,tablet,cars,bikes,electronic appliances,books,bed sheets,watches,sunglasses.I was not knowing they offer options such as services,entertainment,matrimonial,jobs and pets too. That was an new information to me. 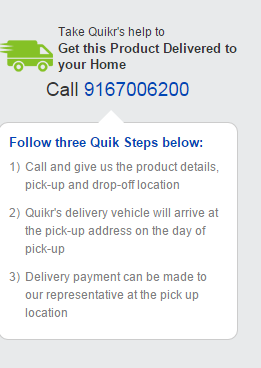 First thing I did on Quikr search was quick change of location. I changed it to Mumbai, so that my search is limited to my city and hopefully I need not wander anywhere else. You can minimize your search by using filters such as price range, nearest area, used/new, ads posted in how many days. I filtered my search according to the price range and nearest area.However there was product delivery facility too. 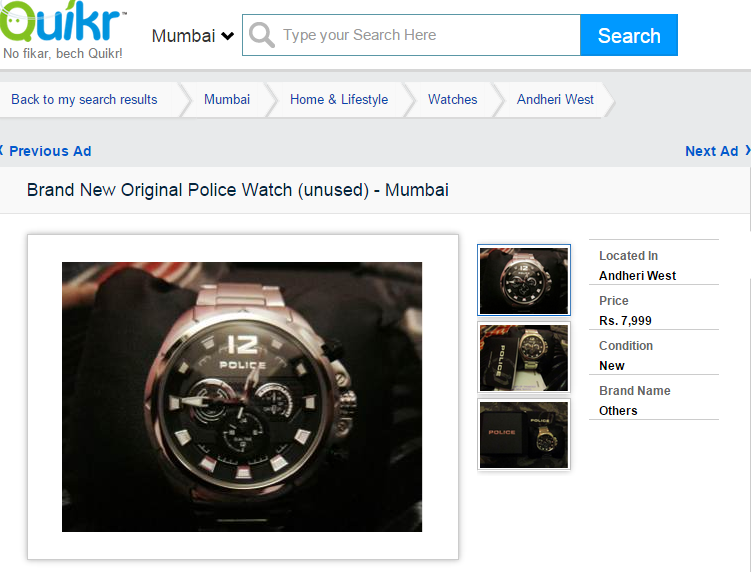 From many days, I wanted to buy Rayban shades, so I thought to look for Rayban shades on Quikr.But that was not my ultimate shopping option on Quikr as i wanted to buy watch for my husband's birthday. My mom said that she is interested in buying old tables which are not so used and I had quick glance on the tables and furnitures,but I guess mom is the best decision maker for these stuffs .Also I had an idea to sell old furniture’s here on Quikr . Now comes my favorite part, I was looking for watches, basically unused watches at lower rates .I got many results according to my filter and I saved many to my favorites. 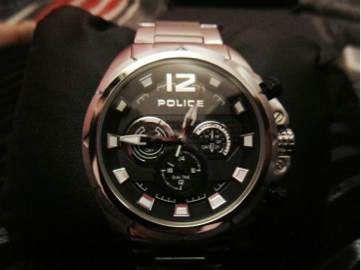 I was amazed to see the unused or less used watches of Gucci, Michael kors, guess, tissot, rado, timex,Police, tommy Hilfiger in good condition and at reasonable rates. I called up on one of the numbers, a lady picked up the call. 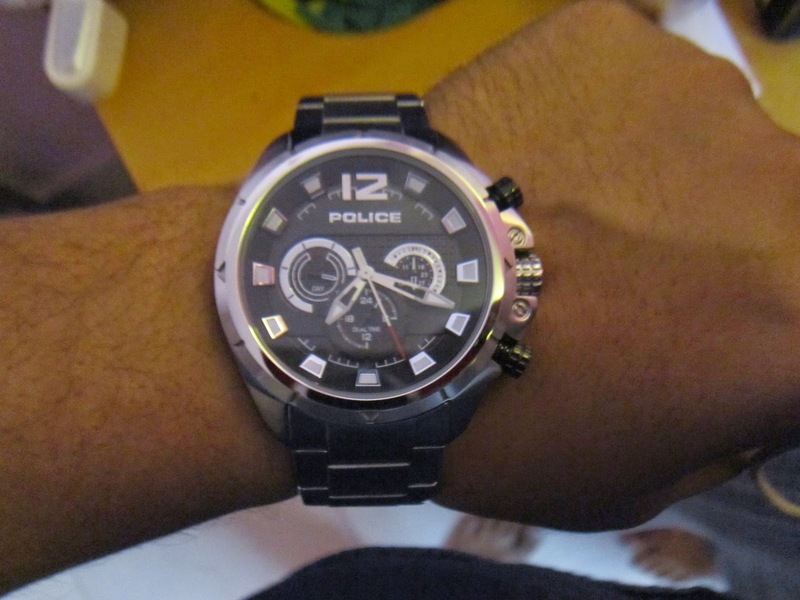 I started enquiring about the product I have seen.Since there was no product no for the watch; I started describing the watch with the brand .But I was surprised to hear the cost more than the cost displayed on website. I asked her to verify the price.She said, "it could be a mistake ,since she had many listings of watch of same brand but different design models".She asked me whatsapp the image of this watch and she will reply me back .I messaged her the image of the watch.She replied the amount higher than one which was on the website .She said it does not includes courier charges and she was not from Mumbai .But I did changed my location to Mumbai .I was not in the mood for hassles .So I tried another number . For other search, the phone number was not reachable, so I did reply to this ad. Reply to this Ad includes the ad title and description ,I did not include my mobile number as I did not find it secure enough to put my mobile numbers in any of the social Internet sites .However I was not notified on my email. So I was unable to trace whether the message was sent or not. But the message on the screen said that it was successfully sent. 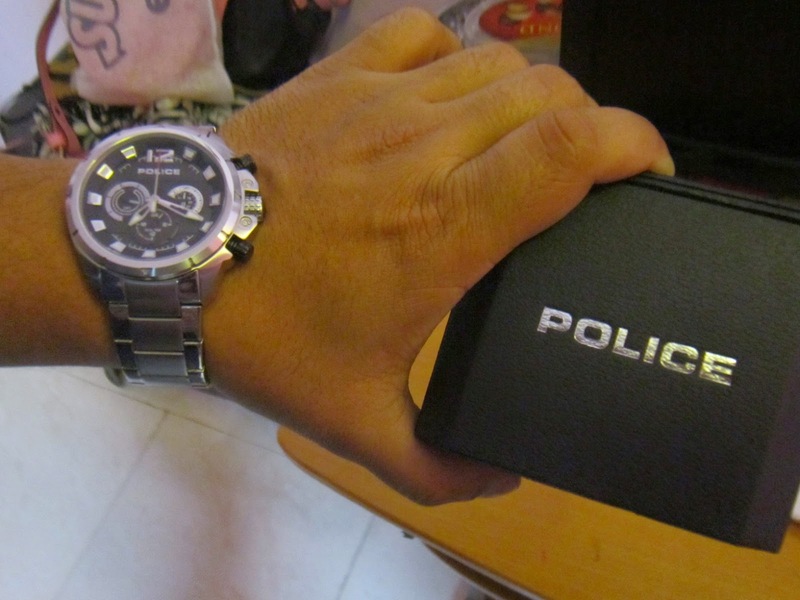 I called up another number of Police watch,favorite brand of my husband .Since the location was nearest and I thought it would be reliable enough for me .This guy was humble and honest ,he honestly said that the watch is brand new and unused ,it was gifted by his client for diwali,but he doesn't wear stainless steel watches.I said okay ,first I will look at it and then buy the watch.We met at Powai location on mutual consent,As a natural girl,I bargained .But he said the original price of the watch is Rs.9999/- and he is selling at much affordable rate.I was in love with the watch ,as I was gifting the watch to my husband on his birthday.And the watch was brand new with good packing and box,this guy also provided me the lifestyle bill receipt.I gave him cash amount of Rs 7999/- and bought the watch home . I had also created a free alert so that I can buy some more watches, you can create free alert by adding your details such as category details, location details, and email address. So that whenever such products are available, you will get a alert . 1. Since the seller is unknown, at times it is not so reliable. You have to enquire and then buy the things you want to. 2. This could be the problem of any online shopping website, till the item is delivered to you in hands, you are still estranged with the item; I mean how it actually looked. 5. There are no discounts for any products. 6. Product no could be helpful for the users. 7. Images should be mandatory, as only description could not help the user imagine the product. I can’t imagine the watch with gold color and diamonds. Or I can’t imagine the painting worth Rs 25,000. After purchasing the item from Quikr .I gifted it to my husband . It was great shopping at Quikr and many thanks to blog adda.But do remember Quikr is acting as a mediator between buyer and seller. You can bargain and you can check the products you are buying and you will be responsible for what you buy at Quikr.Its my personal experience at Quikr. "This post is a part of Quikr.com activity at BlogAdda.com "
Are you a healthy kid ? Going through the pages of my diary!